Tullow Oil. The East African Rift System became an exploration hotspot following prolific exploration success in the Lake Albert Rift Basin from 2006 to the present day. Conventional wisdom and paradigms have been challenged and overcome by the discoveries in this basin and the question now asked by many explorationists is ‘where is the next Lake Albert?’ In 2012 the Lokichar Basin was opened in the eastern arm of the East Africa Rift System in Kenya – but that’s another story. Exploration in the East Africa Rift System is not new, with oil seeps known for at least 100 years around Lake Albert and Lake Tanganyika and sampled by early field geologists mapping the African continent. The Tertiary rifts were tested by shallow wells in the 1930s (Waki-1; Lake Albert) and 1940s but interest then waned until the 1980s and ’90s when these areas were re-licensed following Chevron’s success in the Cretaceous rift basins of Sudan. Amoco was an early pioneer and jointly with Shell drilled a number of wildcats, though with little success. These included Loperot-1 and Eliye Springs-1 in Lake Turkana, Ruzizi-1 and Buringa-1 in Lake Tanganyika and Galula-1 and Ivuna-1 in the Rukwa rift. 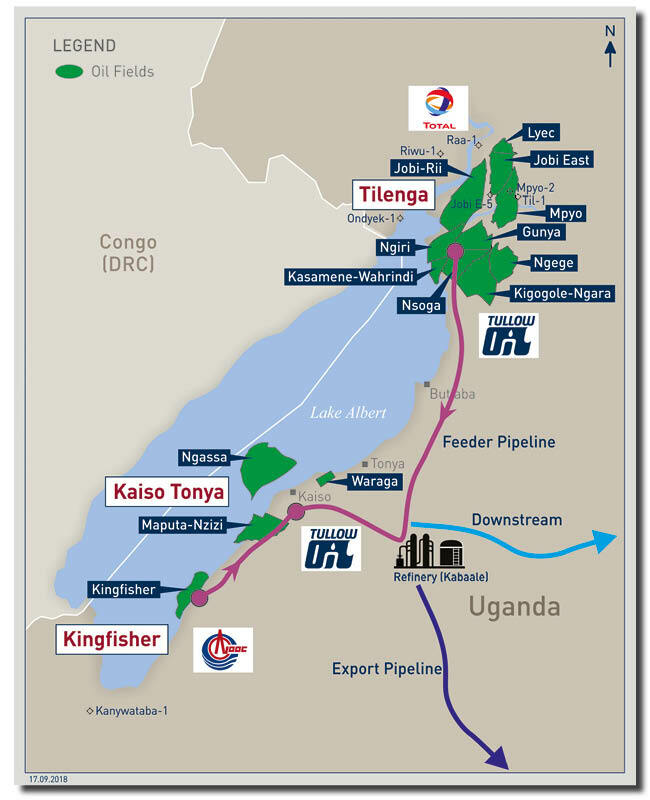 It was only in the early 21st century that interest returned to the rifts, with Lake Albert in particular being a focus for Tullow Oil, as well as Heritage Oil, Energy Africa and Hardman, subsequently all acquired by Tullow Oil and then sold on partially to Total and CNOOC. 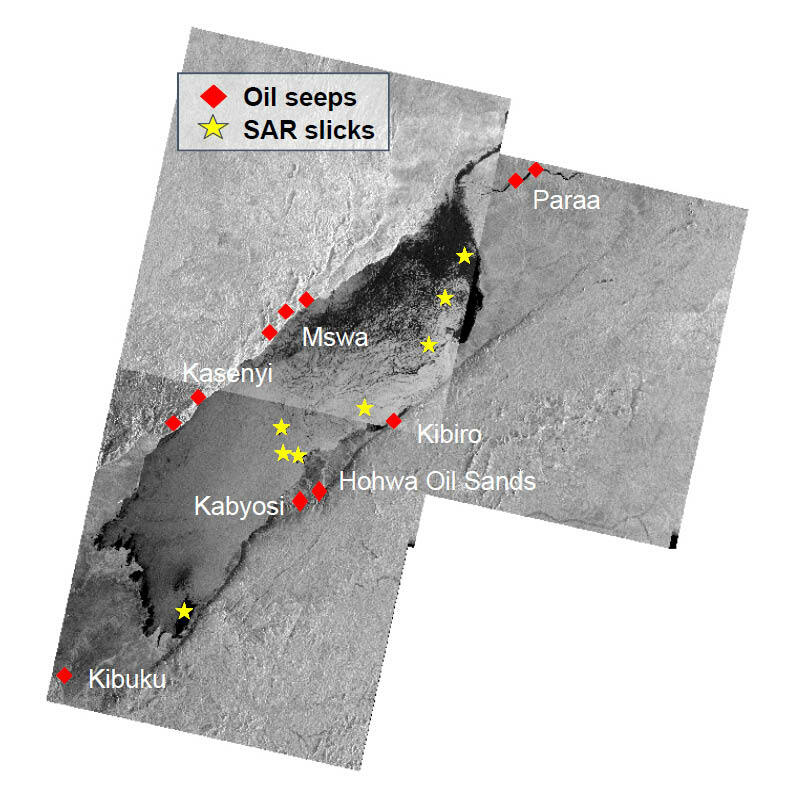 The Lake Albert Rift Basin has abundant natural oil seeps onshore (no sulphur, waxy, 30–34˚ API in wells) and slicks offshore, the latter identified by Synthetic Aperture Radar (SAR). Tullow Oil. In Lake Albert over 20 separate discoveries have been made and the play types to date have been syn-rift dominated. Riftflank extensional folds form just over 25% of the discoveries, including Mputa, Waraga, Nzizi and Kingfisher, whilst the remainder, to date, are intra-rift tilted fault blocks in the northern end of the basin, identified as part of the Victoria Nile Delta play (e.g. Kasamene, Ngiri and Jobi-Rii). A prolific lacustrine Miocene-age Type I/II lacustrine source rock is a key component of the basin’s success and, as the excellent Darcy quality Pliocene-Miocene reservoir sequences are intercalated with the source rock, hydrocarbon migration has been rapid and recent. Indeed, the frequent extensional faults to surface and outcrop expressions of tilted fault blocks and rift flank folds all require extremely recent charging of the traps. A high geothermal gradient in the north allows waxy crude to be mobile as shallow as 250m below the surface. The first seismic in the area was recorded by Heritage Oil and Energy Africa in 1998 in the Semeliki flats at the southern end of Lake Albert. The location was chosen due to its proximity to the Kibuku oil seep. Wells Turacao-1, 2 and 3 were drilled here but no oil was discovered, only carbon dioxide. Interest then moved northwards and to Lake Albert itself, where 2D seismic data was acquired. Waraga-1 test commenced 22nd June 2006 and flowed at a combined rate in excess of 12, 000 bopd. This was the first flow of oil to surface in Uganda and East Africa. Tullow Oil. Interpretation of this data identified the amplitude-supported Ngassa structure and the Kingfisher structure. Further 2D seismic data was acquired over the Kaiso Tonya area onshore to identify a location where the petroleum system could be tested at a low cost and in 2005 a light rig (the Eagle Drill) was mobilised in containers to the basin. The rift flank fold play was finally opened in 2006 with the discovery of oil at Mputa-1 (10m net oil pay). The Waraga-1 (26.7m net oil pay), Nzizi-1 and then Kingfisher-1 (40m net oil pay) discoveries followed. The hydrocarbons discovered at all these locations was sweet 30° oil but it was waxy, with a pour point of 36–39°. At surface temperature the oil was solid like that from Sudan or Chad. The discoveries were all tested in 2006, with Waraga-1 flowing over 12,000 bopd from three zones, Mputa-1 more than 1,100 bpd from two zones and Kingfisher-1 flowing over 9,700 bpd, again from three zones. Porosities and permeabilities were good to excellent. In 2007 Tullow Oil set about appraising the Mputa and Nzizi fields and a further minor gas discovery was made at Ngassa onshore. 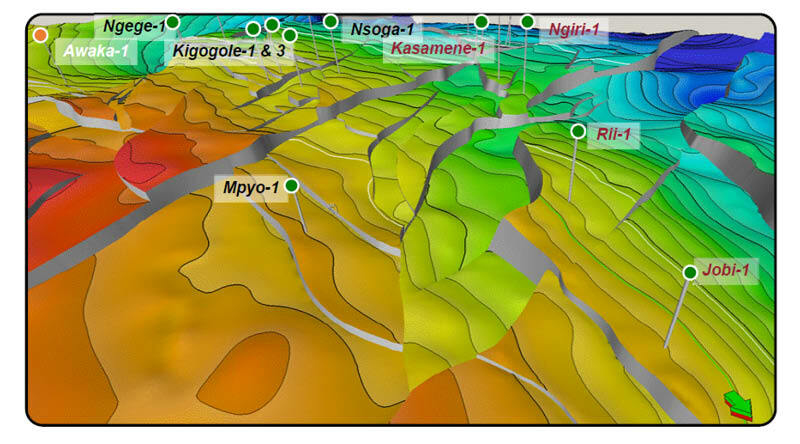 Throughout 2007 2D seismic was acquired across the northern area of the basin, as well as 3D seismic (380 km2) over the Kingfisher discovery and on the Kaiso-Tonya–Ngassa structures (585 km2). 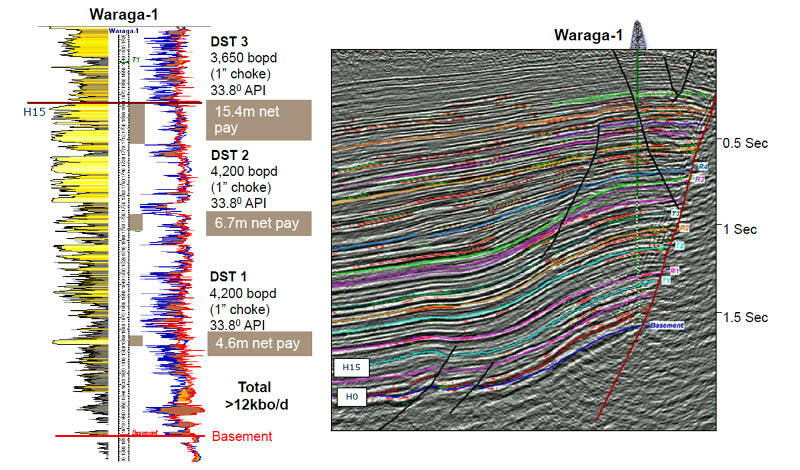 The 2D seismic data acquired in the north of Lake Albert was near the active ‘Paraa’ oil seep and was around and in the environmentally sensitive Murchison Fall’s National Park. Interpretation of the 2D seismic showed a combination of extensional rift flank folds in the east similar to those drilled in the south and also a new play similar to that of the Brent province of the Northern North Sea, with intra-rift tilted fault blocks. In addition there were frequent high amplitudes at the crest of tilted fault blocks, as well as amplitude phase reversals and common amplitude terminations. However, the amplitudes were anywhere from 300m below the surface to 900m and a concern was whether these could be oil, gas or carbon dioxide. Structure map at Top Pliocene Reservoir looking south to Lake Albert. The Victoria Nile play is characterised by thick fluvial reservoirs sealed by lacustrine shale within simple tilted fault blocks. Tullow Oil. In 2008 Tullow moved the OGEC 750 light rig into the Butiaba area in the north of the Lake Albert Basin and an oil and gas discovery was made at Taitai (5m gas and 8m net oil pay), over 70 km from the nearest oil discovery. This was followed by the Ngege discovery (5m oil and 9m gas pay) in an intra-rift fault block with amplitude support. A subsequent minor oil discovery was made at Karuka-1 before the play opening Kasamene-1 oil and gas discovery (31m net oil pay and 6m net gas pay). Kasamene-1 was the key discovery in the north and confirmed the existence of excellent quality reservoir units with porosities of over 30%, permeabilities in the multi-darcies and excellent seal units. It de-risked multiple other discoveries around it in Block 1 and 2 with similar amplitude characteristics. The oil in all the northern Lake Albert discoveries, although shallow, was high quality sweet crude, mobile and at 30–33° API. Despite the shallowness of the reservoirs, a high geothermal gradient of 6–7° per 100m allowed the oil to remain mobile. Kasamene-1, the 3,600 bopd Victoria Nile Play opener, Uganda in 2009. Tullow Oil. A further discovery was made at Kigogole (10m net pay) in swift succession before the rig moved to the then Heritage operated Block 1 at the very northern end of the lake. In October 2008 the Ngiri-1 discovery was made (31m net oil and 15m net gas pay) and then Jobi-1 (28m net oil and 15m net gas pay). This was the shallowest discovery in the basin, at 400m below the surface. Oil was still mobile but had a pore point ranging from 15–24°. The wildcat Rii-1 drilled in January 2009 encountered 38m of net oil pay in pressure communication with Jobi-1 and confirmed a major oil discovery of between 300 and 800 MMbo. By this stage, over a billion barrels of oil had been discovered in Uganda and commercialisation had become a reality. All these discoveries had been made on 2D seismic data. Kasamene-1 was flow tested at 3,600 bopd with no depletion identified and the permeabilities extrapolated were in excess of 10 Darcy. Build-up data indicated a vast connected reservoir; the deliverability of the Victoria Nile play had been established. Subsequent oil discoveries were made at Nsoga, Wahrindi, Ngassa offshore, Ngara, Mpyo, Jobi East, Gunya and Lyec. 3D seismic data was acquired across the north of the basin and from 2010 through to 2014 appraisal wells delineated the discoveries made. The last appraisal drilled in Lake Albert was in 2014. This was the Waraga-3 well which discovered over 120m of net oil pay, demonstrating that significant potential still exists within the basin for those who know where the prize is. 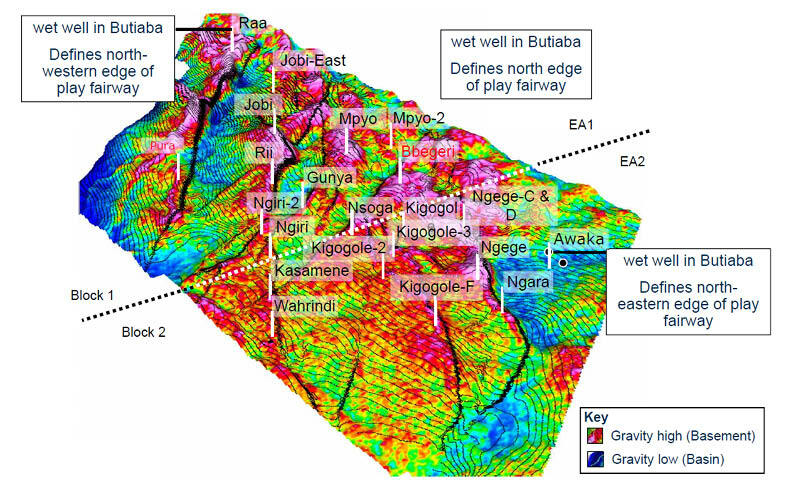 It was not all success: dry wells were drilled at Awaka-1 in 2009, testing the eastern limit of the Victoria Nile play; at Raa-1, Til-1, Riwa-1, Ondyek-1, testing the western limit of the play; and at Mpoyo-2, which tested the northern limit. In the south the Kanywataba-1 well also failed, testing an onshore structure south of Kingfisher. Tullow used Full Tensor Gravity Gradiometry with excellent results in the Tertiary rifts. This northeast view of the northern end of Lake Albert shows Tzz tensor draped on top of Tz residual, with base regional seal contours superimposed on top. Tullow Oil. Tullow has been a pioneer of many high-end geophysical technologies as it has built its rift tool kit which it routinely deploys in the search for oil elsewhere in Africa, such as Kenya, Ethiopia, Zambia and Côte d’Ivoire. The company was the first to deploy Full Tensor Gravity Gradiometry in a large way in the Tertiary rifts in 2009 where it was used to provide a high resolution subsurface image in the Butiaba area prior to the acquisition of 3D. It deployed accelerated weight drop technology to acquire 3D seismic in a light touch manner in 2010 and used nodular technology for the acquisition of the onshore 3D acquisitions in northern Lake Albert. Since appraisal finished, work has continued on the commercialisation of the discoveries. In excess of 1.4 Bbo (2C) as now been found in the Lake Albert Basin area, with the 478 MMbo Jobi-Rii discovery in 2008–2009 being the largest discovery onshore sub-Saharan Africa for over 20 years. A 24” pipeline with a capacity of over 200,000 bpd is planned through Uganda and Tanzania to the port of Tanga, which will be the longest heated oil pipeline in the world. The final investment decision is expected in the near future. In addition, an appropriately-sized refinery is planned in Uganda. Significant prospective resources still exist, with potential to double or triple the discovered basin resource estimate. Big fields get bigger and with water injection and polymer floods planned for the future, the current 2C and 3C resources will surely increase further. Analogues are the South Viking Graben in the North Sea, where over 5 Bbo has been produced. 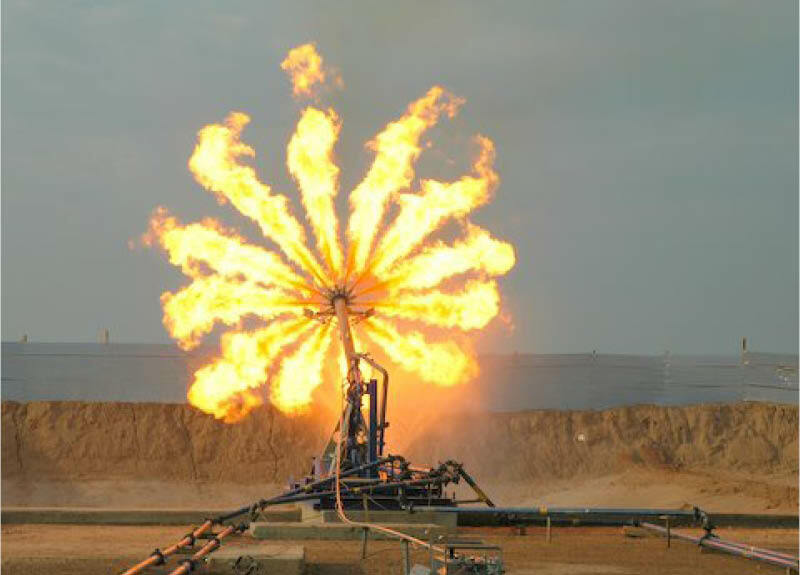 The record of 75 successes out of 83 drilled wells has highlighted the significant hydrocarbon potential of the East Africa Rifts, if the golden thread linking source, reservoir, seal and trap can be identified. Ultimately, the pioneering exploration performed by everyone from the PEPD in Uganda and the independents of Hardman, Energy Africa, Heritage and Tullow Oil to the major oil companies of CNOOC and Total will result in the delivery of Uganda crude to the world market as soon as possible, bringing major investment for Uganda and changing the lives of ordinary Ugandans. Articles similar to or relating to hydrocarbons exploration in the East Africa Rifts. As recently as 2006, East Africa had not figured on the global energy map other than as a cash-strapped importer of oil; now the region is established as one of the most significant hydrocarbon provinces on the Continent. At the tail end of 2011 Petronas, the state oil company of Malaysia, announced the success of an offshore well in moderately deep waters in Block SK316, about 100 km north-west of Miri in the state of Sarawak, which is in the Malaysian part of the island of Borneo.